Kid’s Rock Drum Method Book / CD – Are you a kid? Do you want to rock out on the drums? Well then this is the book for you! 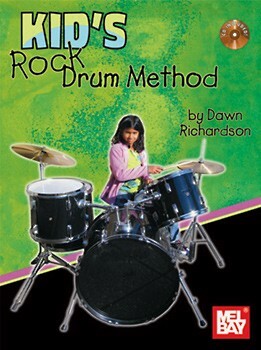 Kid’s Rock Drum Method is full of exercises and beats for the next rock star drummer. The book is geared towards younger drummers but is appropriate for older kids who are beginning, too. The book is moderately paced, introducing concepts one at a time for an easy learning process. Audio CD accompanies the book as well. A great drum book for any kid destined to be a drummer! Softcover Book approx. 8.5″ x 11.5″ and 56 pages. Drums Books at DRUM BUM!